Sunday is the best day to visit Bishkek's flea market, located in the city's 7th district, east of the regular Orto Sai bazaar. It runs along one side of Yunusalieva (formerly Karl Marx) street. Unlike Tezykovka flea market in Tashkent, which is mostly covered, Orto Sai is open air. It takes place not only on Karl Marx Street but all the little sides streets that run off it. If pottering about looking at old things is your cup of tea, then plan to spend a few hours there. Of course there are sellers of Soviet memorabilia such as Lenin pins and medals. There are book sellers and second-hand clothes stalls. However, many Bishkek residents simply come and spread a blanket and sell items from their homes. It is at these stalls that I like to spend time - to find small, quirky treasures among quite a lot of junk. 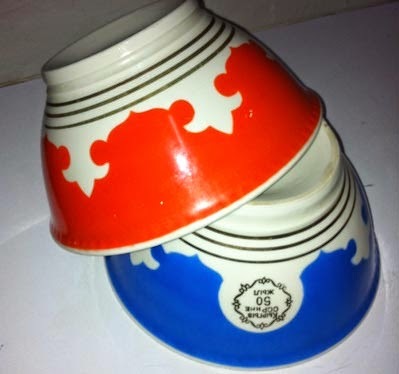 I particularly like Soviet-era soup bowls with Central Asian designs. My collection includes ikat patterns, cotton flowers and stylised birds. I picked up the Kyrgyz ones above for $1 each at Orto Sai - the blue one has a lovely stamp celebrating 50 years of the USSR. 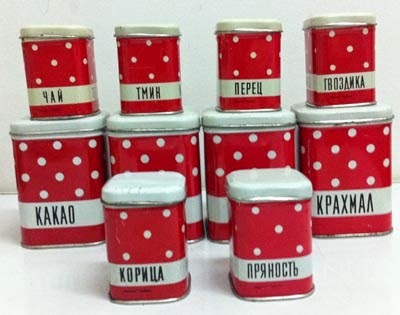 The cute set of spice tins, in excellent condition, was just $2. Indeed, if I had had the space there were many things I would have added to my luggage: 1970s vases, Soviet-era cameras, a Cyrillic portable typewriter. There is no need to arrive early morning. Orto Sai gets under way around 10:00 a.m. After a few hours poking about, jump on a marshrutka (public minibus) or taxi to one of Bishkek's many cool cafés.